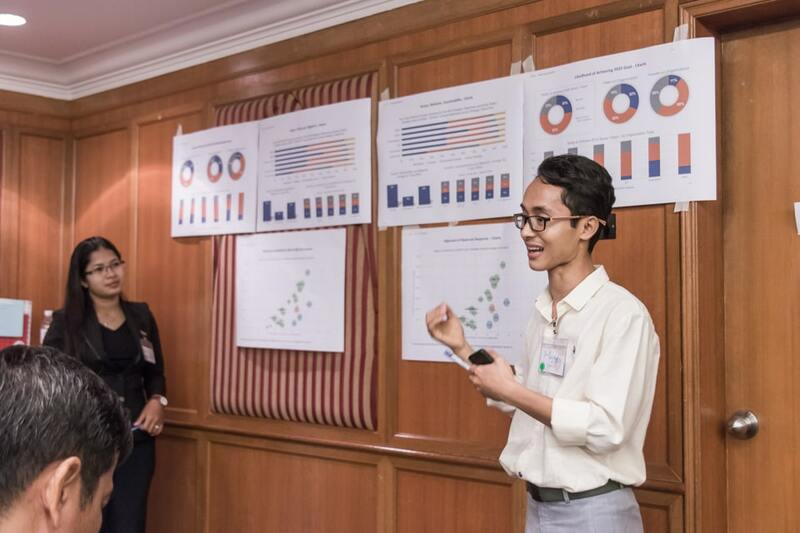 In partnership with WaterSHED, we presented the findings of a national-level Organizational Network Analysis and Systems Mapping study for Cambodia’s Rural Sanitation and Hygiene (RuSH) sector. We could have gone the more traditional route of presenting findings for several hours and answering the questions that arose, or even more simply sending out a final report, but we chose to design a workshop that truly engaged the local stakeholders and acknowledged their role in creating, interpreting, and using the data. This is surprisingly rare. Stakeholders seldom work with, explore, interpret, apply and own the data that a project collects about them, even when it was generated by surveying them in the first place. It is more common that an outside expert or project implementing agency will design research, collect data, conduct an analysis, and write a report or use the data/analysis for their own project work. In better cases, the group conducting the data analysis may present the results and findings to stakeholders, but this still misses the value of empowering stakeholders to own and use that data themselves. One of our objectives was to allow this group of about 100 stakeholder organizations to use the data in decisions and actions of the whole network and of each individual organization – this will be a powerful tool for the structured collaboration process the group is participating in. Workshop participants presenting data to their peers. In particular, we observed (and planned for) two interesting differences to other such workshops we’ve seen in the past: the stakeholders themselves presented the data to one another for feedback and discussion; and the workshop was very sensitive to the local context. Stakeholders presenting the data. To increase local ownership of the data, we had 10 volunteers from different stakeholder organizations take the lead on presenting data and initial findings around several different themes. The 10 volunteers were teamed into 5 groups of 2 where one member of each team could present in Khmer and the other could present the same data in English. This gave those stakeholders the opportunity to really learn the data related to their theme and to develop their interpretations of that data from their perspective working on the issue, in collaboration with their teammate. At the workshop, the plenary session was devoted to explain the data collection and analysis process, and how to read the charts the attendees would see at each theme rather than on the data itself. Then attendees formed small groups to visit every theme in turn and have discussions with their group and the stakeholder experts. The type of data being presented is new to many practitioners. It was a combination of network data focused on relationships between pairs of actors, and qualitative data coded from open-ended interview responses about success factors for the sector. The data was also collected through a census rather than a survey of sampled respondents. This type of data, particularly when the participants aren’t familiar with the techniques, takes time for the stakeholders to absorb and understand, so we gave them the opportunity to really engage with it in small groups and to learn from other stakeholders who truly understand the situation for practitioners on the ground. This also provided a rare opportunity for participants to understand how other stakeholders respond to the same topics. Of course, this data was not simply provided in raw form to the stakeholders – there is still value in having an outside view and a neutral party conducting analysis. The data was then presented in a more digestible form around the themes that came forward based on the analysis. Sensitive to the local context. We’ve been a part of many meetings that incorporate local facilitators, local customs, and local language, but, thanks to our partners in Cambodia (in particular the Cambodian Ministry of Rural Development and WaterSHED), this workshop went beyond anything we’ve seen in the past. As this activity is working at a national level, there are a number of international actors involved and many non-Cambodians participated in the workshop which increased the need for sensitivity and the complexity of achieving it. Our network data also explicitly showed that the sector may be biased toward English language communications, potentially marginalizing certain Cambodian organizations. The opening remarks were provided by Dr. Samnang, a representative of the National Government. To combat this, we combined a number of steps that appear to have had a positive effect on participation. We engaged a local facilitator from the Ministry of Rural Development with years of experience within the Rural Sanitation and Hygiene sector and highly respected by the participant organizations. He led the day’s activities and discussions and used Cambodian traditions and stories to engage participants. 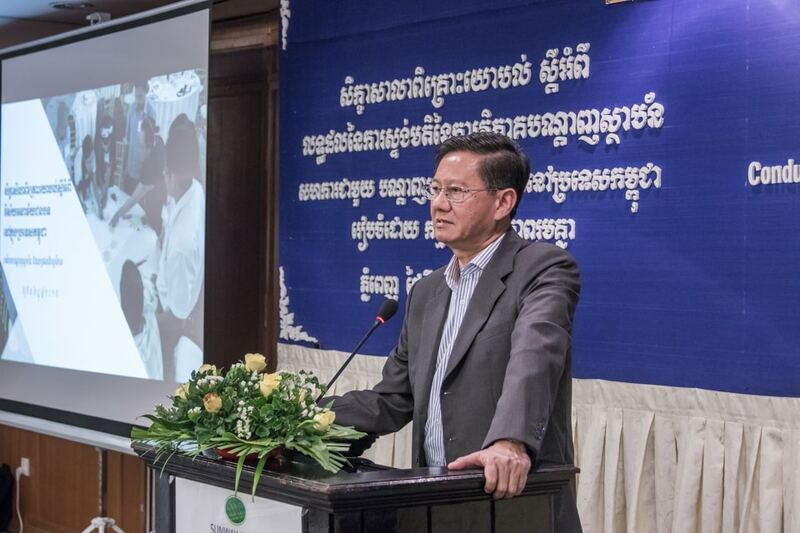 For plenary sessions conducted in either English or Khmer, simultaneous translation was available (it is also worth noting that after this workshop, the Ministry decided for the first time to hold one of the regular sector meetings in Khmer, and again used simultaneous translation). All of the data and materials were available in both Khmer and English, including presentations, handout materials, and diagrams posted on walls around the room. 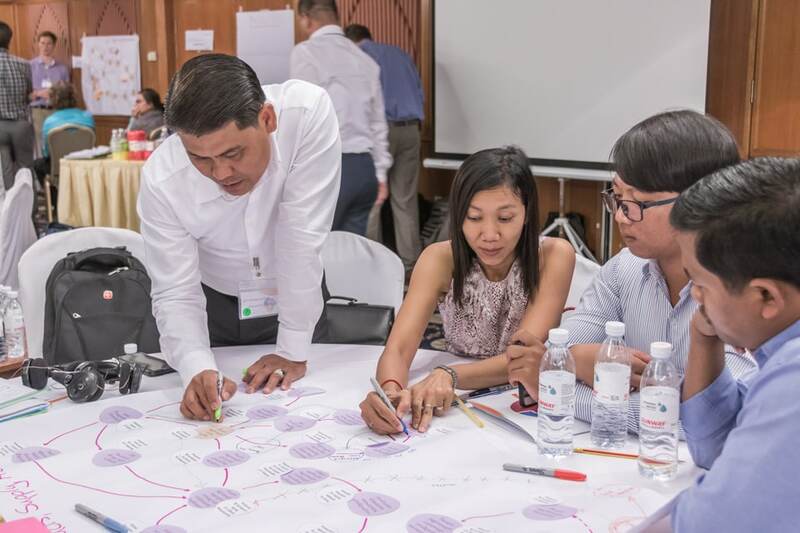 We are sure that there is still more that can be done to continue to build local ownership of data, but we felt that this workshop was a great step for the Cambodian Rural Sanitation and Hygiene sector. This was a highly interactive workshop and a great learning experience. We look forward to seeing the data used by stakeholders in their own day-to-day work and for the benefit of the sector as a whole. In the meantime, we’d like to thank the Ministry of Rural Development, WaterSHED, University of Colorado at Boulder, the volunteer presenters, and the participants for making this a highly interactive workshop and a great learning experience. The USAID Sustainable WASH Systems Learning Partnership is a global USAID cooperative agreement aimed at developing, demonstrating, learning about, and sharing evidence on systems-based approaches for improving the sustainability of WASH services. With implementation of systems-based approaches across Cambodia, Ethiopia, Kenya and Uganda, the WASH community will gain an understanding how, and under what conditions, these approaches can be used in future programs.